For university students, sometime in the future might seem like the best of times. But right now, at least financially, this is the worst of times. Tuition fees are rising while government grants have plunged and jobs are sparse. A recent report found the average indebtedness of graduating students had more than doubled in 5 years, and the study projected in in 4 years it will be three times the level at the outset of the decade. “After all that’s happened, we said, ‘Enough!’ Students have to learn about finances,” says Chantal DaSilva, a third-year political-science student who is vice-president, external affairs, for the student association at McGill University in Montreal. The session, sponsored by Scotiabank, meshes well with recent thrusts by the other major banks to educate post-secondary students about budgeting, debt and money management. As the federal government no longer picks up the tab for defaults on student loans, the responsibility has fallen on banks to develop programs for ensuring repayment. At the core of the resulting strategy is education: banks are trying to teach responsibility and stop financial problems before they build up. “In the past, the banking industry, the government and the educational community haven’t done a good job of educating students about debt,” says Tim Kastelic, vice-president, consumer credit, for Scotiabank. “Those are the sins of the past, however. Today the industry and government are taking a view that if we’re going to lend money to students, we must teach them how to manage that debt. Those sins of the past led to the widespread notion among graduating students that a student loan didn’t really have to be repaid. After all, the federal government backed the loans, was relatively easy to outfox, and was overflowing with dough. Sandra Ferguson, vice-president of student product management at CIBC Finance Inc., recalls chatting even recently with a student who’d signed eight documents for a loan application yet still thought it was a grant. The student market has always been competitive but the intensity heightened as a participating bank is required to lend money, at a level dictated by the government, to any student with a certificate from the government indicating need. The government pays interest on the student’s behalf until graduation, but then the student and bank are on their own. For six months after graduation, interest is accrued and capitalized, and the student is responsible for it when the loan is consolidated at the end of the six-month period. However, the government does pay a risk premium on the principal to the bank for handling the loan. And if the graduate falls into unemployment or low-income work, the government will step in to pay interest for up to 18 months during the first five years of repayment. A blizzard of loan programs has also been introduced by the various banks, supplementing the federal and provincial government efforts, which are directed at students whose incomes fall below certain levels (about $50,000 for the federal program). BMO pioneered a student line of credit as part of its Brain Money package of financial products and services for students. Students can borrow up to $5,000 a year – or $20,000 during their educational careers – at prime plus 1% if they meet the usual credit criteria or have a co-signer. Additional funding is available for students in postgraduate studies. The program is available not just to universities and community colleges but also to students at trade schools or studying abroad. A unique chiropractic program in Buffalo, N.Y., for example, draws a large number of Canadians accessing the line of credit. This program’s advantage over normal loans is that, as it’s a credit line, students only pay interest when they use the funds. And as with loans, students are only charged interest while they’re in school. After graduation, payments escalate over time with earnings. The program exceeded its first-year sales forecast in the first three months of roll-out and other banks have quickly followed suit with their own lines of credit. “It has taken off big-time,” says Ward. Students may be fretting over debt but they’re an attractive market because most have yet to develop an allegiance to a specific bank. There are no studies proving that a linkage exists between a person’s first bank and his or her future bank of choice, but the banks hope to forge cradle-to-grave bonds if they serve students well. “The prevailing belief is start early and keep the relationship for life,” says Mary Giles, CIBC’s marketing manager for Classic Visa cards. Credit cards are another front in this avid competition, as banks fight to be the first to sign up students and at the same time educate them on how to use a credit card properly. Here, unlike government loans, credit history can be checked for missteps but the reality is that most students don’t have a credit history. That’s one of the selling points, for the students and society: students are advised they can learn to handle credit responsibly and develop a favourable credit profile for the future. But they do go bankrupt – and the rate is increasing. In a 1 year period, a total of 7,850 people with student loans outstanding declared bankruptcy. 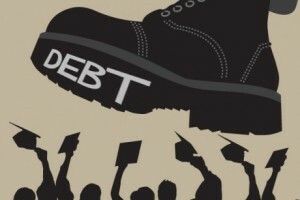 Bankers are concerned that bankruptcy has become too easy for recent graduates; tales abound of students walking into trustees’ offices the day after graduation to wipe out their debts. Proposed amendments to federal legislation will prevent recent students from declaring bankruptcy within two years of graduation. DaSilva’s conference taught students about budgeting and introduced personal-finance issues. “It’s tougher these days. We can’t take personal finance for granted anymore,” she says. Harvey Schachter is a freelance writer who is based in Kingston, Ont.